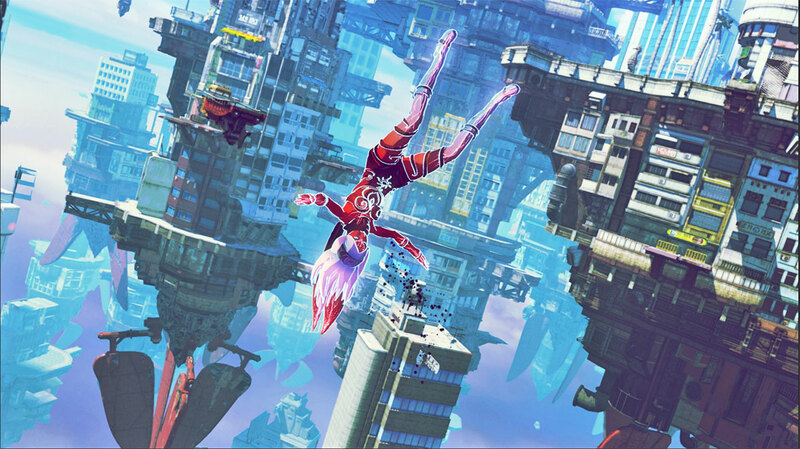 The original Gravity Rush for the Vita was a fun quirky little game let down by tedious combat, a hectic hodgepodge of a story, and a terrible forced motion control system. Its remake Gravity Rush Remastered eliminated that control scheme and added the DLC with the package but still retained the rest of the old problems. So how does the newest entry in the franchise fair? First there is an improved sense of scale and cohesion. Since it’s been made as a console game from the beginning there is a grander scale for the new locations. There’s the bizarre rift plane where you’ll mine special ore for upgrades, and the city of Jhirga Para Lao, which is split into three layers with a literal high, middle, and low-class you can fly to at any time. Though there isn’t much interaction you can do with the townsfolk, there are still an impressive number and variety walking around, and the design of the town as a sort of massive sky harbor town contrasts nicely with the homogenous cityscape of Hekesville and the improved stylized graphics make help the cities come to life. Perhaps most importantly, the story of the game feels more like a cohesive narrative. There are still a multitude of elements like otherworldly horrors, mad scientists, superhero shenanigans, and dimension hopping. However, there is a consistent theme throughout the story that keeps it all together. Mainly, the horrors of a corrupt government and the great divide between the snobby elite and the downtrodden poor. Though a bit heavy-handed at times, it helps with the overall superhero narrative the game has going for it. Best of all, we finally get to learn the protagonist Kat’s backstory! It’s a tad odd since the game rolls credits after you fight an Akira style final boss making you think the game is over. However, this simply unlocks a special epilogue mission which adds a few more hours of story missions to the game. The result is a solid tale that fits well with the themes set earlier and adds some new caveats to the original game’s story. The true final boss is an intimidating creature and though the way you ultimately defeat him is a tad sappy (think clap you hands if you believe) it ultimately works, if only because Kat’s optimism and sincerity continues to make her one of the most engaging video game protagonists of the current generation. So though the story and setting have been vastly improved, what about the gameplay? Well flying around continues to be the highlight of the game, which is made more interesting with the addition of the Lunar and Jupiter styles of gravity manipulation. These can completely change your gameplay with Lunar makes you lighter, giving you more maneuverability and the ability to leap up walls and jump vast distances. While the Jupiter style makes you heavier allowing you to travel faster but with decreased maneuverability and unleash devastating ground attacks. Unfortunately you shift into these styles with the bizarre touchpad the PS4 has making it incredibly easy to accidentally shift back to default. The combat while relatively the same has more of a sense of refinement to it. You feel less clumsy when gravity kicking enemies and the ability to lift objects is actually useful since there’s more of an abundance of debris and more accurate targeting system. The fact that you get to fight human enemies instead of just the strange other dimensional Nevi adds more variety, especially since you can pick up many human enemies and toss them at each other which is a sufficiently empowering good time. That and the ability to unlock talismans that improves your abilities adds a more personal touch. Unfortunately, there are a few missions that require stealth, which you fail almost instantly if spotted. Since almost none of the gameplay is geared toward this style of gameplay it becomes a tedious trial and error as you try to see what predestined path the game wants you to travel. And though the variety of side missions is nice there are a few stinkers. There are entertaining ones where you fly around town delivering coupons or straight up kidnap people to take them to a shop. However, there are also tedious ones like moving a woman’s furniture, and an infuriating vague mission where you have to follow a dog around until it decides to continue the mission. There is also new camera system were you can take pictures of yourself and the environment. Aside from being used in many story and side missions, the camera doesn’t add too much. However, it does allow you to take pictures of hidden treasures throughout the world, which you can share with other players and vice versa. It’s nothing spectacular but it does lend more of a sense of community to the game, though honestly you can ignore it and not miss anything. Though the combat has improved, the real fun comes from flying around so in that sense the game isn’t significantly better than its predecessor. However, the story actually feels like a consistent plot rather than a series of events. The environments, tone and designs are still unique in a French animation meets western superhero meets Japanese anime sort of way. And the fact that we finally get a well-told back story on Kat makes an already endearing character even more so. And with up to 20 hours of gameplay when one configures all the side missions, challenge missions, and mining shenanigans, it’s definitely worth your money and more importantly your time. NextPlaystation Plus Reviews for the Games of February.